If you want knockout results in 30 days without lifting a single weight, this is the workout for you. 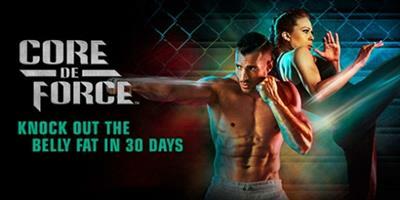 CORE DE FORCE is unlike any other MMA-inspired workout in the Beachbody catalog. Joel and Jericho brought in exhilarating Boxing, Kickboxing, and Muay Thai combinations and mixed them with fat-blasting cardio and bodyweight moves to help you zero in on stubborn belly fat and carve allover definition. You'll move through 3-minute "rounds" in which you'll alternate between various fighting combinations with bodyweight moves and cardio spikes to kick your calorie burn into overdrive. No matter what your fitness level, you can punch, kick, and sweat at your own pace. Season 04 , Episode 02 -"Back Up"